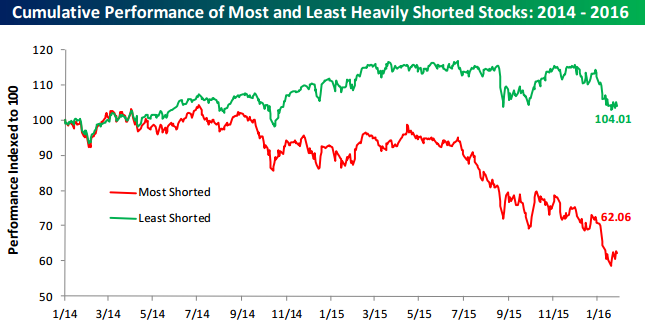 Short Sellers Continue To Have the Upper Hand | Energy and Gold Ltd.
A 42% gap in performance since the beginning of 2014 between the most and least heavily shorted stocks in the S&P 1500. Short sellers are usually very smart and generate intelligent bearish cases on stocks that typically have poor earnings quality, high debt loads, or unsustainable business models. The problem is that the long term trend of the market is very much against selling stocks short. The fact that the most heavily shorted stocks in the market continue to perform so poorly adds credence to the view that we are in the midst of a bear market cycle in U.S. equities. Shrewd market observers will want to keep an eye on the most heavily shorted market sectors (energy:12% short interest and retail:11.44% short interest) for clues as to whether we are experiencing a normal market correction or a much deeper bear market cycle; those with a keen eye will notice that after a big drop to begin the year the most heavily shorted stocks have bounced more aggressively than the rest of the market.